Located in the heart of the “Grand Paris” close to “Carrefour Pleyel”, Saint-Denis power plant was commissioned in 1933 to supply the Parisian metropolitan. It closed in 1981 when production declines. In the 1990s, during the shoot of LEON, Luc Besson noted this abandoned place and thought immediately of its transformation into a major center of film production in Europe. Indeed, France is the leading producer of film, but until now, there was unfortunately no place to challenge other European studios, such as PINEWOOD or CINECITTA. This unique complex allows to integrate the whole supply chain of movie working (writing, set design, shooting, post-production, preview…). 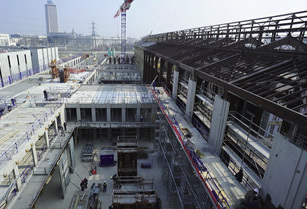 “VINCI” and “LA CAISSE DES DEPÔTS ET DE CONCIGNATIONS”, who supported the project, also gave financial support for its creation and construction began in the first half of 2010. Two years after the Cité du Cinéma was born. This project combines rehabilitation, construction and unusual technical installations. All know-how’s had been mobilized to create one of the finest technical innovations. VINCI and Reichen and Robert & Associates, specialists in rehabilitation practice, accepted the challenge of one of the most iconic Parisian operations. The “Nef” made of glass and steel (220 m) serves 20 000m ² of offices with the headquarters of EUROPACORP, the activities of film production, “Ecole Supérieur Louis Lumiere”, Ecole de la Cité and 9 studios . Each of these studios combines extreme technical constraints such as sound isolation and anti-vibration pavement. In the spirit of the original building, the “Cité du Cinéma” keeps an industrial soul that combines “Art Deco” and modern art. 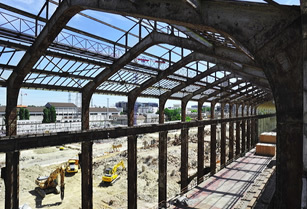 The EIFFEL framework, the choice of materials and the preservation of historical elements of the old building contribute to the identity of this rehabilitation. BLUE EVENT operates exclusively the venue and event planning.